My late mother’s childhood was spent in bayou country, South Louisiana. As a result, I grew up with some very unusual pronunciations. That white stuff you spread on your tomato sandwich: “MY-nezz.” The bowl you run water in to wash the dinner dishes: “Zinc.” A canvas sheet you spread over your trailer to keep your load from blowing out: “tar-POE-lee-uhn.” If you went into a store today and asked for the “tarr-POE-lee-uhns” or the “TAR-p?-lins,” you’d probably get a strange look. Hardly anyone calls them anything but “tarps” today. And, there’s no fabric in it anymore. It’s plastic on the inside and plastic on the outside. 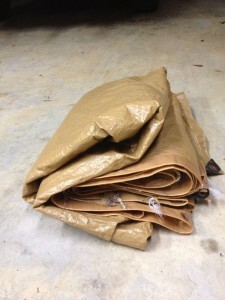 When you first purchase your tarp, it’s conveniently packaged inside a cute plastic bag with a handle. Good luck getting it back in that bag again! However, it’s doesn’t have to consume 9′ x 24′ of storage space. Here’s how to make it smaller, no scissors required. First, fold the tarp to the approximate outside dimensions that your preferred storage spot demands. 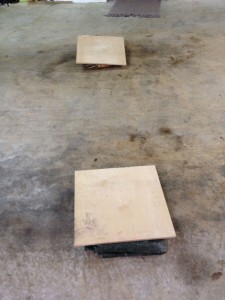 You pay a lot of money for premium lumber. When there is a chance of rain on pickup day, it pays to take the time to wrap it up and keep the moisture content low. Whether you call it a tarp, a tarpaulin or a tar-POH-lee-uhn, it’s the item custom-made for this job. 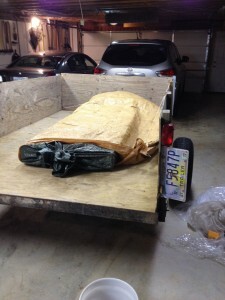 When first folded, this 9′ x 12′ tarp takes up a good bit of space. Now you need at least one, two might be better, pieces of plywood as big as or a little bigger than the folded tarp. If you don’t have a smooth concrete floor to do this job, lay your first piece of plywood on the pavement or ground. 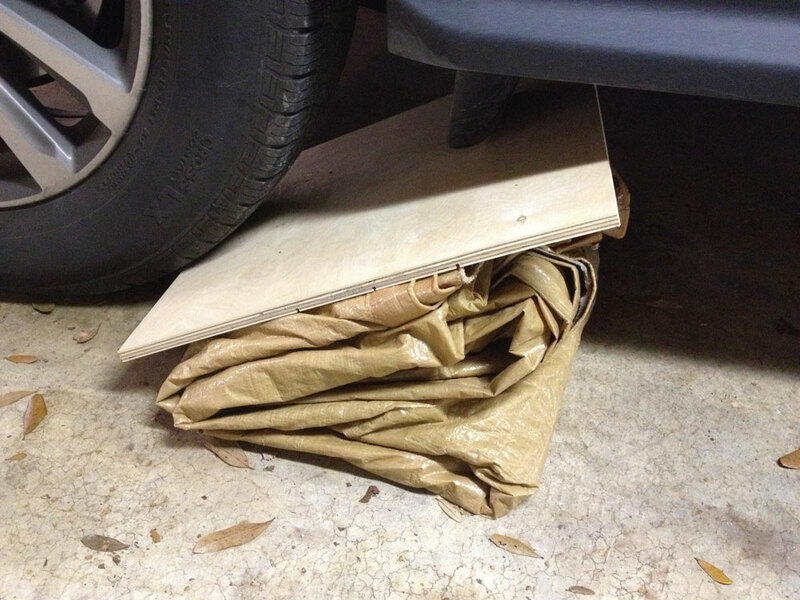 Next, center the folded tarp on the plywood, then put your other piece of plywood on top: Something of a plywood/tarp sandwich. No mayo. 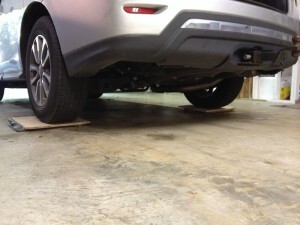 In our case, the garage floor is smooth enough that we didn’t need a piece of plywood on the bottom. If I’d been doing this in the street, on asphalt, I would have used one to protect the tarp plastic from puncture damage. Now, line up your front or rear vehicle tire on the middle of the plywood and carefully drive up until the tire is roughly centered. The car’s right rear tire is centered on the plywood/tarp sandwich. Eeeeeaaaazzzzzze up onto the scrap plywood slowly. 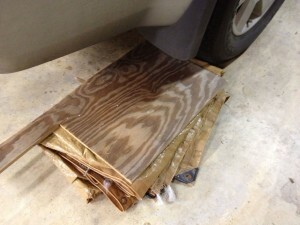 Too fast and you might overshoot, causing the plywood to lift up in the front, possibly contacting the car. 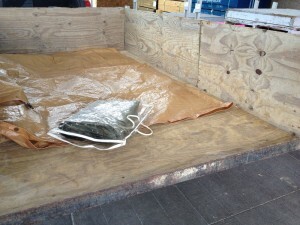 This time I chose to compress two tarps at once. Just call me a madman. I’ve always done this when I can leave the car on top of the sandwich overnight, but I suspect a few hours would do just as well. After a sleepover, these two tarps are flat, and staying that way. The idea is to let the plastic take a “set” so it will stay flat while you stuff it into a big Ziploc bag or put it on the appropriate shelf. 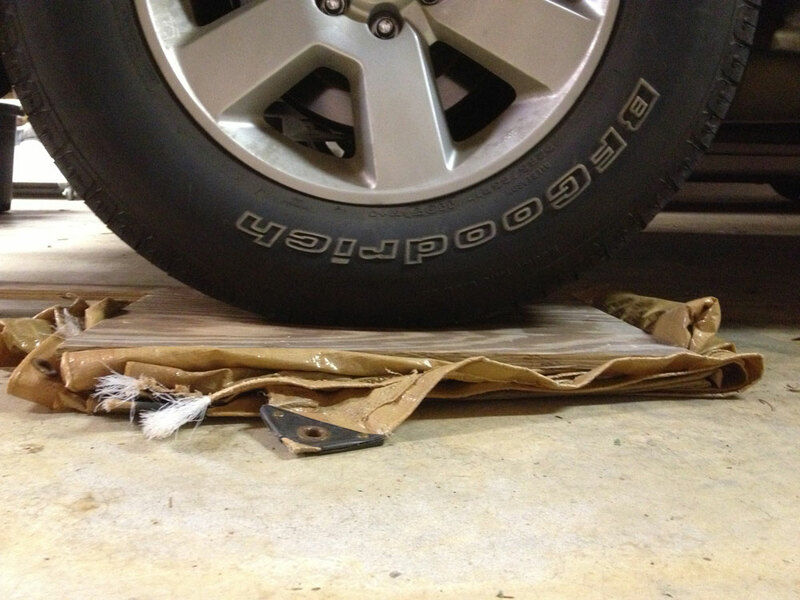 Now, your tarp won’t take up nearly so much space until you need it again. 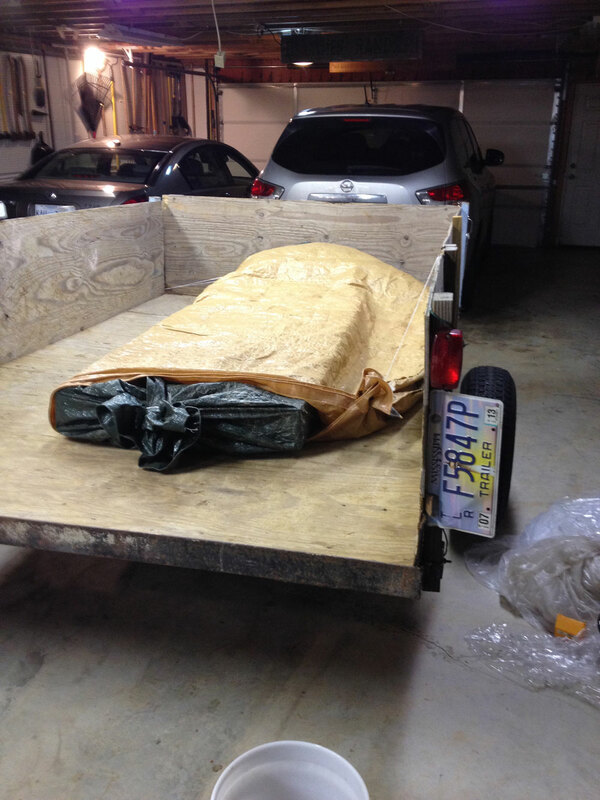 Before and after: Now, the compressed tarp easily fits into this blanket bag (you do save the bags your electric blankets and bedspreads come in, don’t you?) and not take up much room on its shelf.